What do native language speakers talk about in real life? Answer: whatever’s going on in life right now! It’s summer. they definitely talk about that. The hot weather, summer sports and going to the beach. The World Cup just happened. They definitely talked about that. Then, there’s the upcoming fall season, a new school semester – oh yes. School: they talk about that too. These topics are incredibly common, practical and relevant. In fact, you probably talk about them too, so learning the relevant words in your target language for these topics is a must. If you’ve noticed the new Free Vocab Bonus emails in your inbox, you’re already using vocabulary lists based on holidays, current events and practical topics. And now, you can review all the Vocabulary Lists in one place for FREE. 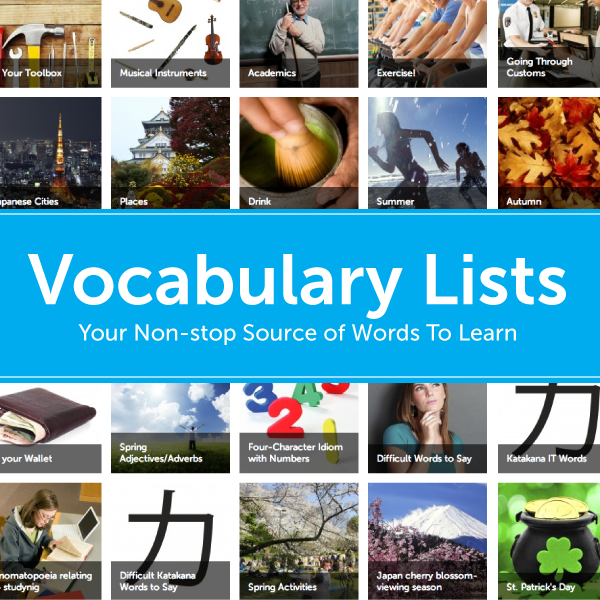 Vocabulary Lists: Your non-stop source of new words to learn, in easy list form! You learn timely and practical words that are delivered directly to your email inbox. From holidays to current events, you get just the vocabulary you need to talk about what’s going on in life right now. Find this free feature in the Resources drop-down menu on all 31 of our Innovative Language Sites. Learn even more language with these complimentary lists. In every list, simply review the words or phrases, listen to the audio pronunciation and repeat out loud! You can also auto-play the words for a quick review and leave a comment with your own sample sentences or questions. Click here to preview Vocabulary Lists on JapanesePod101.com! This feature is available on all 31 Innovative Language sites, from ArabicPod101 to VietnamesePod101. If you’re not yet learning a foreign language the fast, fun, and easy way, be sure to choose from 31 of our languages and sign up for your Free Lifetime Account today. Click here to choose from 31 languages and sign up with a Free Lifetime Account!